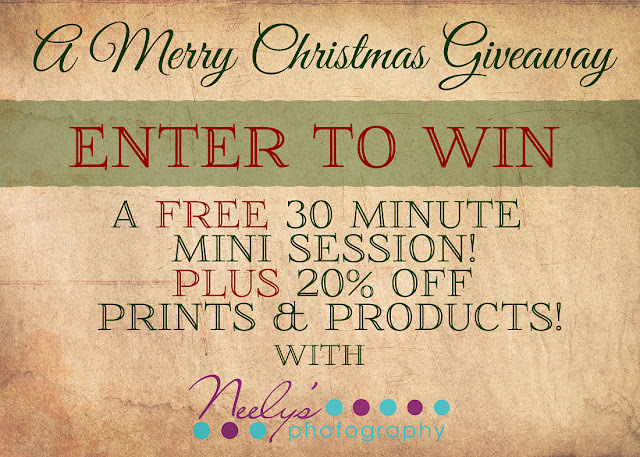 Neely's Photography: A Merry Christmas Giveaway!!! I have some exciting news!! Because Christmas is coming and I think you're all awesome and I appreciate all of your support, I want to hold a giveaway!! The giveaway is for a FREE 30 minute mini session and 20% off of prints!! This is important - You must make the shared post public on your page or else I cannot see that you shared it. To make it public: Find the the post on your page. Next to the time that you shared it there should be a little icon. Click on that and there will be a drop down. Click on "Public". This will only change that post and not the rest of your page. If you do not do this I can't confirm that you have shared the post, so this is important. Thank you! :) Also, you can share the post daily, but make sure you come back here to confirm you shared in the box below so it counts towards you entries! If you have any questions you'd like answered before you enter (or after) please don't hesitate to ask! I hate to be a fuddy duddy, but there are always rules to make sure the giveaway is fair to everyone. To be entered you MUST enter through the box above. You MUST like Neely's Photography. The session MUST take place at least 1 year from the date the prize is won (Neely's Photography is not responsible if winner does not redeem prize). The session MUST take place in a reasonable distance from zip code 64855 as determined by Neely's Photography (No further than approximately an hour and a half away and/or approximately 70 miles away). The giveaway only covers the cost of the session and only offers 20% off of prints and products. This does not extend to any other offer and cannot be combined with any other offer. Winner will be selected with random.org and contacted via email. Winner has 48 hours to respond before another winner will be selected. Nathan and I would love to win this giveaway! This is our first Christmas together and would be a super awesome surprise!! Our cat and Pug also love being in front of the camera, so they would be ecstatic too (that is, if they would be allowed to be included) Thanks for your generosity! I would like to win this because you have taken our pics several times and do a great job!! I have a wife and 3 daughters that love to have their pictures taken. I would love to win this free session because I am wanting to have family pictures done with my two boys. You do a great job at this and I believe you would be one of the only ones that would be able to get the boys to smile for the pictures. I would love to win this because my mom is wanting family pictures done and we have only had them done once since my parents have been married (27 years). This would be the perfect opportunity for us to have them done. I would love this win this! I want to win! So I can hang out with you!